When people say Boros, I usually reply with "no thanks, I'd rather be on ANYTHING else", but this time I was wrong. I have seen the LIGHT that is Boros Mentor! It’s a fast deck that can get turn four kills and doesn’t require a heap of focus because it’s really just “lol turn stuff sideways, make it bigger, smack you in the face”, so let's get into the deck and talk about some of the awesome stuff we crammed in. 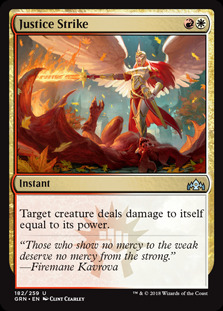 We are running four Justice Strike , and hoooo boy is this one of the best removal cards in Standard right now for the most part. Doom Whisperer ? DEAD. 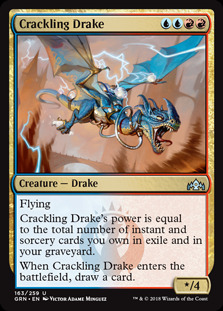 Crackling Drake ? Fried chicken. All this power packed in to a 2 CMC instant is just bonkers when you can fell the mighty for such a small mana investment. We're running only one Path of Mettle but I would probably run at least two of these. This is a legendary Enchantment, that deals 1 damage to each creature that doesn't have First Strike, Double Strike, Vigilance or Haste when it enters the battlefield. Attack with at least two creatures that have First Strike, Double Strike, Haste, or Vigilance? Transform it into Metzali, Tower of Triumph. The Tower is pretty great as you can tap it, spend a red and colourless to deal 2 damage to your opponent or tap it and spend white and two to destroy a random attacker. This can save you in a tight spot or just give that extra reach on the damage front. 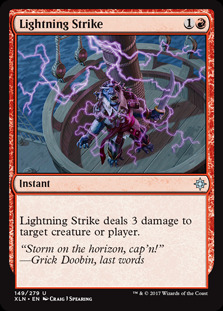 Speaking of awesome and cheap, we're running four copies of Lightning Strike to either dome out our opponent to provide extra reach, or fry off annoying blocks on the field to make sure our creatures land blows. The throw in “flex spot” in this deck is a card that I thought was going to be the next Hammer of Bogardan. It is, I feel, underplayed and doesn't see any play in Standard. It is considered to be a bulk rare rare now, very likely due to it being a sorcery. Repeating Barrage does 3 damage to any target, so it's not horrible. But again, sorcery speed is a bit of a drawback. With Raid, you can pay five to put it back in your hand. Okay look, this is fairly bad, but we can repeat it. Feel pretty good. I'm not, uh, I'm not scared at all. I just feel kind of... feel kind of invincible. 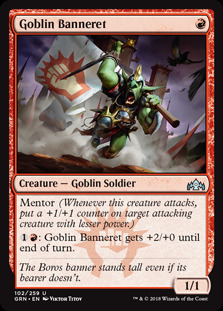 Now we need some of those amazing Mentor creatures to smash face, probably one of the weakest cards in the deck, Goblin Banneret is a 1/1 Goblin with Mentor and for one red and one colourless, until the end of turn, it gets +2/+0. So you should technically always be able to to trigger that Mentor ability. 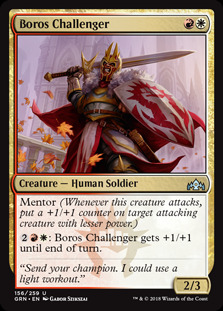 Boros Challenger is good and interesting for a 2 CMC 2/3 Human soldier with Mentor. Although he's really cheap for those stats and Mentor, you can pay the outrageous two colourless, red and white to pump himself +1/+1. Just don't ever do that. That's a waste of mana that is certainly better used elsewhere. Next up we have Swiftblade Vindicator and we're playing three. 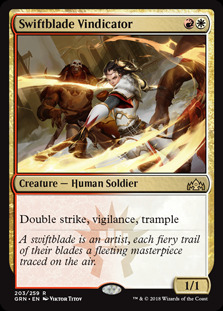 On paper, Swiftblade Vindicator looks pretty good, a 1/1 trample, vigilance and double strike powerhouse in a Mentor deck. Especially when you pair it off with Aurelia, Exemplar of Justice , he just gets scary and stupid. However, he is a very smol boi and a lightning rod for removal. Expect to cast him and see him die at the hands of your opponent fairly quickly. 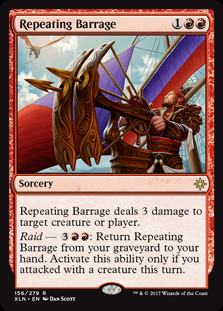 Break out the music instruments, because we have Militia Bugler who can pretty much pick up most creatures in the deck. The boogie woogie bugle boy gets your Goblin Banneret , Boros Challenger , Swiftblade Vindicator , Aurelia, Exemplar of Justice and even your Legion Warboss . Sadly, only Tajic, Legion's Edge isn't a target. Speaking of great creatures, Legion Warboss is one! 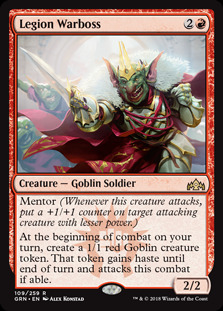 Mentor and an ability that streams out tokens to continue to power out? This is a good way to flood the board with tokens especially if you're looking to send a message to your opponent, or if you have a Heroic Reinforcements and in an all out FLUNGE! 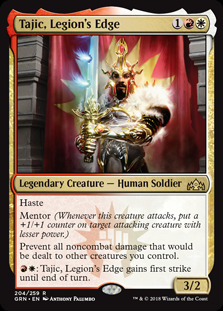 Speaking of good Mentor triggers you've got Tajic, Legion's Edge Haste. Mentor. Prevent all noncombat damage that would be dealt to other creatures you control. Wait, HOLD THE PHONE. Prevent all non combat damage to your creatures? Burn will no longer be able to zap your dudes! I mean we should probably also get hype at Mentor and Haste too, I guess. We're running two Aurelia, Exemplar of Justice you could probably make this 3 but I kind of wanted to try and keep this deck as budget as possible while still being competitive for a Boros deck. 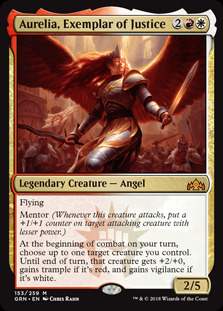 Other than having, shock horror, Mentor, Aurelia also gives a red creature +2+0 and trample or a white creature vigilance. Considering how many creatures we run that share both colours, Aurelia is simply a massive nuke. Speaking of options we are playing two copies of Integrity//Intervention as one side is a mini pump and the other is extra reach with a little healing. Also at two copies we have Response//Resurgence that allows us to kill an attacker/blocker or take a 2nd combat. I mean, this is likely just overkill, let's be honest. But it was fun to try and feel free to remove it and replace it with..... anything? Anyway, I love this deck. It can kill on turn four, it rarely has unplayable hands and it has amazing burst potential. And at the end of the day, it makes stuff dead. Try it out!